In 1915, when San Francisco’s City Hall, designed by Bakewell & Brown, opened to the public after the Great Earthquake destroyed an earlier edifice, architect Arthur Brown, Jr. couldn’t have predicted that a digital light show would grace the Beaux-Arts building a century later. 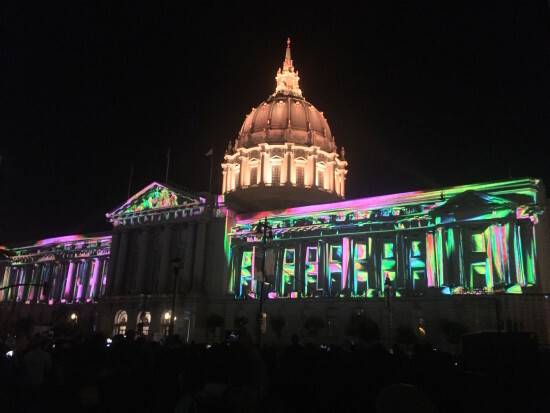 But, San Francisco Mayor Ed Lee recently proposed just that—his plan would allow for corporations and city events to use the east façade for projected light and multimedia displays. The San Francisco Examiner reported that the proposal immediately opened up a debate about whether civic structures should be used for commercial purpose and calls attention to the blurry boundaries of public-private partnerships, especially between the city and tech companies. In a text message to the paper, supervisor John Avalos expressed his concern that the display is an advertising opportunity for local companies. The mayor’s office contends it is an expression of creativity to enhance special events held on Civic Center Plaza. “Like City Hall brought to you by Facebook, Salesforce, Big Brother of Public Private Partnerships Ron Conway?” he wrote, referencing one of Mayor Lee’s most prominent backers. “What’s next, selling naming rights for City Hall and all the other Civic Center buildings?” he continued.